After a jolly Christmas, and with Tom and Lyn escaping the recent frosts for a visit to warmer climes, progress has once again been caught by the camera. Well, if Lyn had been here there would have been a much earlier post, as her phone seems to get the detail that my phone obstinately refuses to capture. The O-gauge layout not only has track laid, but this wonderful fiddle-yard traverser turned up last week. 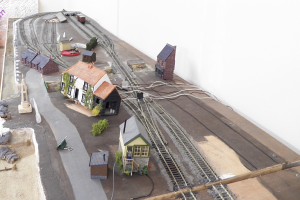 The club’s new 00-gauge layout has got to the stage where the finer details are being added, if you look really hard you can just see the churned up sand where a dog has froliced in the way they do. 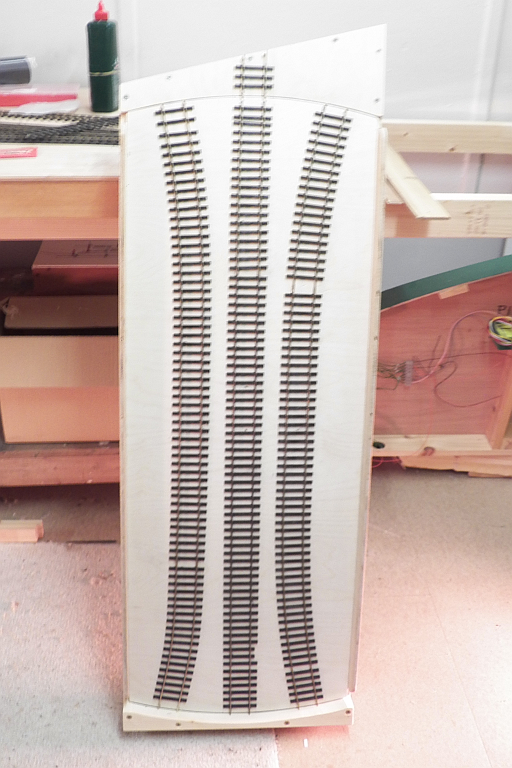 The n-gauge test track has had the rear section of the inner loop replaced by flexitrack, which now allows all the locos (foreign, I admit) that I can bring along to run round without throwing themselves off. 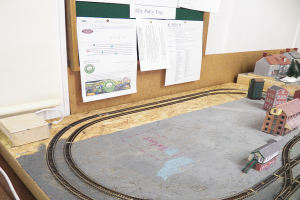 And although I admit I was dubious about the incredibly tight radius of the track Tom forced around this board, not only Thomas, but a Terrier, can run around. Our newest member, Peter, was sharp-eyed enough to spot why the Annie (or Clarabelle) coach would buffer lock but the troublesome truck wouldn’t; the tension-lock choppers on the coach were perhaps 1mm shorter than the ones on the truck. 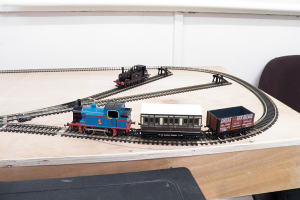 This layout is also scheduled to make an appearance at our 2017 exhibition, and the idea now seems to be to have a Colonel-Stephens light railway, with Thomas on hire to cover for boiler washouts.